The Canterbury Tales , written in the 1390, may have played in establishing English as a literary language to the standard French and Latin and upended the notion that English was inherently inferior to the classical languages, but man, they’re really hard to read. I mean, look a this. Well, I guess if you go slow you can get the gist. The pilgrims of Chaucers story are a hodgepodge; the Knights, the Miller, the Pardoner’s, the Prioress, the Wife of Bath, etc. and the stories range wildly from love to hypocrisy to humor. Chaucer also wrote this stuff in iambic pentameter, the same form that Shakespeare would later use for his plays but which is not intended for common speech so don’t use it as it just makes you look stupid. 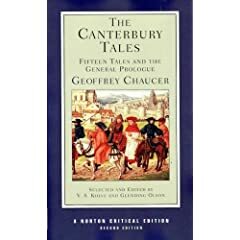 Since the Canterbury Tales are the foundation of all English literature and since they cover such a wide variety of topics, you can always use them to impress people since no one you will ever meet has actually read and understood them. Now you can say, ‘That reminds me of the Canterbury Tales’, and everyone will be really impressed and perhaps nod, especially on a college campus. Chaucer was able to obtain his education after his family inherited a fortune from all the extended family members who were killed by The Black Death. Older PostWhy do we have wisdom teeth?